The MōVI M5 3-Axis Motorized Gimbal Stabilizer from Freefly is designed for mid-sized DSLRs, mirrorless cameras, and camcorders weighing up to 5 pounds, including the lens. For camera stabilization the M5 uses three motors and an IMU (inertial measurement unit) to detect and counteract unwanted movement along three axes: pan, tilt, and roll. In particular, compensating for handshake or vehicle-induced vibration and reducing translation. There is a quick-release adapter available separately so that it can be mounted on cranes, jibs, vehicle mounts, and other camera support equipment. There is also an MR (multi-rotor) conversion kit, available separately, so that it can mounted on a UAV. The system supports single- or dual-operator control. In single user (Majestic) mode the system's software intelligently differentiates unwanted shake or vibration from intentional movement, such as panning, while keeping the horizon level. Alternatively, you can have a dedicated operator with a remote control or RC transmitter who is in charge of camera pan, tilt--and if you want--roll. In this configuration the camera will always point where the operator of the remote tells it to, independent of how the rig operator moves. As with sled-style stabilizers, the camera should be balanced on the MōVI to ensure best performance. Once balanced, the MōVI will need to be linked via Bluetooth to an Android mobile device or a computer or tablet running Windows to finalize the configuration process. Two lithium-polymer (LiPo) batteries and a charger are included, as well as a top handle for low-angle shooting or transporting the assembled rig on set. 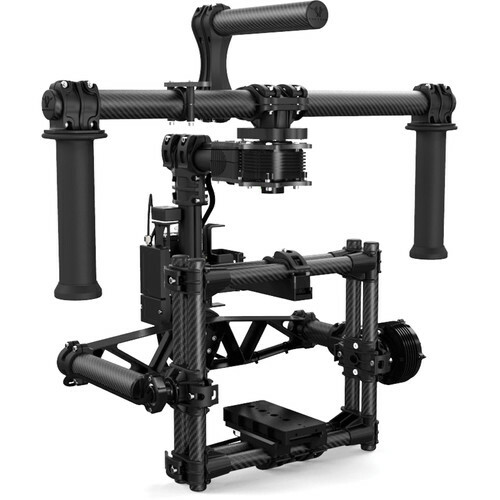 Box Dimensions (LxWxH) 28.0 x 20.0 x 6.0"
M?VI M5 3-Axis Motorized Gimbal Stabilizer is rated 4.5 out of 5 by 22. Rated 5 out of 5 by Anonymous from Amazing footage We bought the M5 for my wifes videography company, specializing mostly in weddings and documentaries. The footage this thing produces is unreal. You can basically run down the street filming and it looks like you're on a track. We bought a $ knockoff gimbal (DYS) initially - complete waste of money. Yes the Movi's price is steep, but it took 10 minutes to balance out of the box. It's also bluetooth enabled (which we didn't know), so you can change the settings wirelessly from a free phone app. If you have endless hours to troubleshoot a cheaper gimbal, that may be the way to go. If you can make this work for the budget, definitely go with the m5. Rated 5 out of 5 by Anonymous from Very Impressed (compared to Ronin) Very pleased with my M5 so far. I am flying a GH4 with speed booster and sigma 18-35 most of the time. I'm not a big guy, so weight was a significant consideration. The Movi M5 is strikingly lighter than the Ronin. That alone makes it worth it for me. I found the installation of the camera to be a little more complicated on the M5 than the ronin, but the result was a more secure and stable attachment... so thats worth it to me. The software for fine tuning the Movi's settings have seemed far more intuitive than the Ronin so far was well. Having used both I'm extremely pleased with the decision to pay a bit more for this product. Rated 4 out of 5 by Anonymous from An investment - you'll need to invest in nice gimbal. wish it worked with my iphone (you need a separate wi-fi adapter $$160). This makes it difficult if you want to just grab and go. You'll need to bring your laptop with you/buy the dongle or purchase a separate android tablet. Also wish I could attach it to my tripod. You need a special adapter for that too ($135). Also, would be great if these things attached quickly without the need of special tools - oh wait, there's a special adapter you'll need to purchase for that too ($300). Again - nice gimbal, and works right out of the box as such. BUT I wish these things were built in already. Rated 5 out of 5 by Bruce Almighty from Love the M5 - Hated the Helix I'm a Hollywood narrative and Indie documentary Filmmaker with thirty-five years of paid professional experience behind everything from Panavisions to ARRIFLEXs to DSLRs. As an experienced shooter, I am often approached with free samples in hopes that I will reciprocate with sweetheart endorsements of said products. No thanks; in order to be able to speak freely and honestly about product utility, I choose to buy my own gear just like the rest of you. High dollar equipment purchases are not something that I take any more lightly than any of you do... As a matter of practicality, I generally prefer the simplest solution to any given problem and for camera stabilization I have chosen to wait quite a while to commit to an electronic gimbal rig. I like the no batteries required mechanical approach of Steadicam's passive gimbal approach and have used their products with great success for many years. And I will doubtless continue to do so when far away from electrical power sources. That said, I finally decided to take the plunge for a gimbal rig to help stabilize my cameras in windy conditions. After what I thought was conscientious and thorough research, I bought a Letus Helix directly from Letus. I confess that I DID use my industry credentials' to ask for priority delivery because I knew that I had a big commercial shoot on the immediate horizon a perfect opportunity to shake down a new rig while it paid for itself on its first job. I received no response to my fast-delivery query but prepaid for the back-ordered Letus Helix and waited my turn. It arrived many weeks later just two days before I was to leave for my distant location job. The Letus Helix came with virtually no instructions and the videos posted on the Letus site were neither complete nor helpful. Check them out for yourself; they're rather sad, really.. I am, fortunately, mechanically inclined and once I figured out a way to get the magnetically attached battery to stop falling out of the rig also eventually figured out how to statically balance the Helix. This latter task required the use of tools at every juncture and was not a swift process. I should also point out that the Helix is all-aluminum in construction (quite heavy compared to the MoviM5's carbon fiber construction) and this means that the simple act of tightening the many Allen screws necessary to establish the static balance will scar the black anodizing considerably. When I finally got to the point of powering-up the Helix, the extremely buggie firmware proceeded to repeatedly slam my camera's lens into the aluminum framework of the rig. I managed to shut the beast down down but upon each subsequent attempt at start-up while on the phone with the Letus tech support guy, the unit would once again try to beat my camera senseless. The whole process, slowly using tools to establishing static balance, watching helplessly as it slammed my camera around, and making multiple unsatisfactory support calls to Letus consumed an entire day of valuable gear prep time sorely needed for other production tasks. Extremely frustrated, I sadly contacted Letus one last time to informed them that I would be returning the Helix and that I wasn't interested in exploring their suggestion that it might just be the motherboard. As soon as I hung up I called and hired a trusted gimbal operator who came to my rescue with his own MoviM5. The job went smoothly. Once back from my multi-week shooting spree (where I was very impressed with the MoviM5) I contacted B&H and ordered my own MoviM5, case, extra batteries, etc. They had one in stock and, as always with B&H, my package arrived promptly. Did I mention that it was less expensive than the Helix? A nice bonus that you will see that needed as this tale unfolds... OMG! Actual instructions! The M5 gimbal actually came with beautifully printed and concise instructions! Using no tools, except for one simple adjustment with a lovely little custom Allen driver that is included in the kit, I flipped around a few tool-less locking clamps and had the rig statically balanced within minutes. And then I turned it on. And it worked perfectly. And continues to do. The end. Well... almost. As a epilogue, I'll share that Letus insisted on charging me a 15% restocking fee because I left town to shoot the aforementioned job and didn't manage to return the Helix within the allotted 15 days. In subsequent conversations with my Producer, Letus stood their ground and helpfully suggested that I should resell it on the used market. I wouldn't wish this particular Letus Helix on my worst enemy, so I declined. I also refused the opportunity to use my 15% restocking fee as a credit towards other Letus products. Call me crazy but I'm not a slow learner. Losing nearly a thousand bucks in a restocking fee was a small price to get that heavy and annoying device out of my studio as quickly as possible. Taking that loss, and taking advantage of the lower priced and vastly superior MoviM5, may be the best decisions I've made in recent memory. Lesson learned - no more going manufacturer direct for me I'll buy through B&H every time. Very poor customer service from Letus. Rated 5 out of 5 by Haven S. from Wonderful but one dimensional without remote Really love the Movi M5 - it's lightweight and super easy to balance. Really lovely. Only complaint is that without a remote you can't pan or tilt. So if you are wanting to shoot something up the hill - you literally have to raise your arms and camera as high up over your head as you can as the camera will remain completely horizontal. Was hoping there would be a mobile/tablet app that would allow you to control it but haven't found that so far. Hope it's in the works as the $3500 remote is far too pricey for me and I'm sure, many others. Rated 5 out of 5 by Alex D. from The best stabilizer there is. The short: The Movi system is the best brushless gimbal I have used, hands down. I would recommend it to everyone. It's not flawless but it operates the best of any gimbal I can run. Get one. The long: I've used a lot of gimbals over the last almost 4 years. I personally own a DJI Ronin, a Besteady One and the original Freefly Radian 3-axis gimbal. I've also done demos with the Letus Helix and the Ronin-M. None of them operate like the Movi. In fact I wouldn't have even considered buying the Movi until they released the new firmware 5.0 (which I will talk about below). I couldn't justify the cost until then and to be honest I lost a lot of faith in Freefly after a conversation I had with Tabb at NAB a couple years back about the flaws in the radian system. To put it nicely, he didn't care about the problems I saw with the system and was a bit rude when I pointed out the flaws. But I will say getting the M5 has given me some new faith. It is the best, most stable gimbal I have run. There are moves I can do with the Movi that I cannot do with any of the other gimbals (specifically a low angle, tilted up, parallax tracking yaw movement). Try it on any of the other gimbals and it will freak them out because they don't compensate well for movement in 3D space. The side-to-side acceleration trips them up. Not on the Movi. I equate to the GPS, but I've also tried it without GPS signal and works without it as well. I'm extremely happy with the Movi and its pretty much unlimited range of creativity and movement. I've also found it the easiest to balance because of the full cage. The cage makes balancing super easy and it keeps the camera locked down to the gimbal. It stays balanced all day even with extreme movements. The new time-lapse mode in firmware 5.0 is also amazing. I have been playing with it for a bout a week now and have been extremely impressed. The software to program time-lapses on Mac OSX is a bit clunky and needs work, but once you figure it out it's easy to program. I'm sure that will improve over the coming months. turning a gimbal into a programmable 3-axis head for motion control is a huge benefit. It was one of the main reasons why I bought this gimbal. It is worth it. Through all that good, my biggest problem with the Movi is still Freefly. I think they make some of the best products on the market. I am in love with my Movi, and their support for it is good. Their forums are a great knowledge base. But I think overall the company is arrogant. I've never seen a company release a product and then raise its price for no reason 6 months later (i.e. the Alta). I would think that they would want to create brand loyalty, but from experience that do not seem to care about maintaining their older clients with Cinestars and Radian gimbals and helping them move to their newer better products. They don't want to address the flaws of the old products, but rather ignore them. I'm just not a fan of the culture. But, if you can tolerate that they make a fantastic product. All-in-all if you want the best, best a Movi. Rated 5 out of 5 by DavidVideoloco from Yes you CAN fly the 1DXmkII on the M5! Yes. Just plain old, YES. It's preposterously easy to set up once you watch the walk-through video. And, I got worried because I wanted to use this with our new Canon 1DXmkII as the go-to combo for getting the most buttery smooth stabilized 4K at 60p and on Freefly's website is says it's compatible with the 1DC and the C100mkII. How big could the 1DXmkII be?! Ha ha! NEWSFLASH: It's a BIG DSLR, and it's HEAVY. I was immediately struck by how obviously TOO BIG it was for the MoVi cage. However, all you need to do is remove the top cross-bar on the cage and drop the 1DXmkII right in there. No problem, other than finding a good HDMI cable that doesn't interfere, but that's not that big of a deal. I shot two days in a row with this, all day, right out of the box after mounting it once and it worked flawlessly. I need to spend more time tuning it perfectly to my various needs, but it was fantastic and fully reliable immediately. Very pleased. Also, do yourself a favor and get the laser cut hard-shell case. It makes life much easier, and you can even keep the camera (minus lens) mounted when you drop it into the case for transport. Rated 5 out of 5 by DeeLane from Amazing piece or equipment This is my first gimbal, but after extensive research and taking advantage of the $ savings on the flash sale last week, I can say this product was worth every penny and more! The weight of this system ALONE is worth spending the extra money rather than settling for a DJI ronin. After getting it set up, I would strongly suggest watching all tutorials available on the freely website. Once you can master the app, the learning curve become a lot less intense. Bottom line, this is your best bet if you have a DSLR and are looking to stabilize your shot in countless types of shots/angles. This is STATE OF THE ART technology from a company that LIVES AND BREATHS video/cinematography that cost you a FRACTION of what most pro gear costs. Will this work with a Canon 80D? You can fly the Canon 80D with this stabilizer. Is it usable with a Sony FS700 with smaller fixed lens? Unfortunately, the Sony FS700 is too large for the MOVI M5. In fact because it is so long it's dimensions even exclude it from the larger FREEFLY MoVI M10. We suggest using it with Steadicam type or Easy-Rig type systems. hi, i need 4 surveillance cameras to be in a room that is shaking, what do you recommend ? So that we may best assist you, please email us at provideo@bhphoto.com. Planning purchase of M5 and Movie Ring Pro...is anything else required to mount the M5 to the ring? Any compatible and relatively affordable vest/arm kits recommended for this unit to help reduce strain on operators arms? I am waiting to check Steadimate with steadicam pilot. Do you think the Movi M5 can handle the weight of the Panasonic GH4, Metabones speedbooster, and the Tokina 11-16 or is that too much? As long as your camera equipment does not exceed 5 lbs. Will this work with an Canon 80D? Does anyone know if the M5 is compatible with the Canon C100 Mark II? I heard there were some issues with the viewfinder being too large. Thanks for your help!